Cats sleep most of the day, and they usually find a comfy spot to sleep. It may be your bed, favorite chair, pile of books and papers, fresh pile of linen, in addition to a piece of furniture, or in an isolated corner. For my cat Mittens, those were preferred spots at the same time or the other, that’s until I got her a cat basket. I put it in her favorite corner, added an old towel for cushioning, and at first she ignored it. Two days later I added her favorite toy to the cat basket, watched from afar, and waited patiently. Since that day it was her preferred, cozy spot. Cat baskets are available in a number of sizes, they are composed of different substances, are available in most pet stores, and can be bought online. Prices are reasonable, and our faithful family members deserve to be treated to their own place. They don’t just sleep in their basketthey stretch, and play and roll. When shopping for a cat basket you want to consider not only the size, but also the age of your cat. 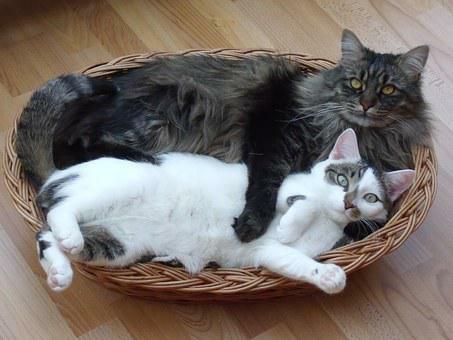 For those who have a young cat you need to buy a cat basket big enough to accommodate a growing cat. The cat basket ought to be large enough for the cat to stretch out, as cats often do, into whatever place he or she likes. The vast majority of cat baskets I have seen are made from interwoven rattan/reed, typical basket material. Including a pillow, blanket, towel, or older, but clean clothes is all that is needed. Regular washes, just as you would any pet bedding, is all that is necessary to maintain hygiene. I occasionally use old towels and clothing then discard when soiled as my cat spends thirty minutes to an hour outdoor each day, and after consuming all that grass I expect vomiting. Whenever the rattan/reed material gets soiled with vomitus, I just wipe with a moist soapy cloth or disinfectant. Cat ribbons are also made from plastic and foam rubber. The foam rubber is usually covered with a zipped, machine washable material which can be easily laundered from the washing machine. All you have to do is unzip and remove foam. The plastic variety, I avoid because of fear of potential toxic exposure to BPA to my furry friend. We have to be cautious when purchasing items made of plastic whether for humans or for our animal family members. As have been shown by the media some products, including plastic items such as toys and feeding bowls from China and other foreign countries, may contain toxic substances containing BPA and other products contribute, which can be detrimental.